Note: Call (719) 447-1923 to arrange a jail visit by leading Colorado Springs criminal defense attorney for your loved one today. If you or someone you care about has been arrested and is in jail at the El Paso County Jail in Colorado Springs, it is important that they receive an Attorney Jail Visit as soon as possible. 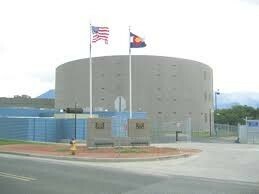 The El Paso County Jail and Detention Facility in Colorado Springs, Colorado houses an estimated 1500 inmates at any given time. The volume of inmates at this facility as well as the primary purpose that it serves (which is ideally to house inmates temporarily) may make locating an inmate somewhat of an hassle. This article is geared toward ensuring that you are able to locate and get in contact with your loved one if they are indeed at this facility. Awaiting transport to state or federal prison after being sentenced. Serving their sentence (primarily short sentences for minor convictions). If you believe that a friend or relative is being detained by law enforcement at this facility; you can search for that inmate using the Inmate Search option available on the El Paso County Sheriff’s website: http://shr.elpasoco.com/inmate-search#!/search. Searches may be done by using either the inmate’s booking number or their last name. The information located on this website may be confirmed by contacting the sheriff’s office at 719-390-2151. El Paso County Jail and Detention Facility utilizes a Video Visitation System that allows visitors to correspond with a detainee through a monitor and telephone. These visits are monitored and recorded and may be used as evidence in court, therefore it is recommended that you exercise discretion when visiting an inmate. An inmate is allowed a maximum of three visitors per visit. All visitors will be required to present a valid government issued photo ID. Persons under 18 years old are required to be under adult supervision at all times in order to visit the facility. Visit El Paso County Detention Bureau for more information.